I was reading this CNN article, by bestselling-author Bob Greene, about the Terrifying Tumbleweed and the menace it poses to Westerners trapped in their homes behind walls of tumbleweeds. The enlightening article prompted me to do some research into tumbleweed. What I found was even more surprising. Tumbleweeds are generally classified as members of the species of Salsola. Salsola is a genus in the family Amaranthaceae. Salsola’s include tumbleweeds, Tartar thistle, and Russian Thistle. Certain species of amaranth, baby’s breath flowers, and others, do also tumble. Tumbleweeds are annuals that dry out at the end of the season, until they break away from their stem, free to spread their seed as they tumble across the country. Tumbleweeds are unstoppable, capable of rolling over chain-link fences, highway barriers, and escarpments. Stirring up all these images of tumbleweed, you may be picturing one rambling across a dusty road, running through a western outpost. This probably wasn’t the case, at least until after 1870 when the suspect shipment of agricultural flax seed arrived in South Dakota, imported from Russia or the Ukraine, where the Eurasian tumbleweed grows. The irony of this story is, the South Dakota climate was too harsh to grow flax, but the tumbleweed did more than survive. It has reached a level of iconic status reserved for saguaros, not state flowers, and certainly not invasive species. Another interesting problem associated with the roving tumbleweed is radioactive plant material being carried out of Washington State’s Hanford Nuclear Reservation. The tumbleweed very efficiently extracts radioactive material from the soil via their taproots that is later stored in the plant material. A 2001 article in the Seattle Times reported that search and destory crews were deployed to test and destroy all tumbleweeds for radioactivity. This has got to be the coolest plant. And I’m not the only one who thinks so, Thomas Jefferson grow this ornamental and edible vine on a black locust arbor, next to his 1,000′ vegetable garden, in the early 1800s. I purchased the seeds from Onalee Seeds. I’m really happy with the stuff I got from her. She may charge more than other people, but they are fresh and she stands behind the products. It says all over that she will replace the seeds if they do not germinate. I don’t know of any other seller who guarantees germination. I got a mixture of Lablab purpureus and Lablab purpurpeus Alba. I am assuming that the darker seeds are purple and the lighter ones are white. They’re really cute looking, like tiny clams with the foot sticking out. The seeds packet states it can bloom in just 50-80 days, that’s fast. I think this plant and I have a great future. I have a feeling they will love the hot and humid weather. 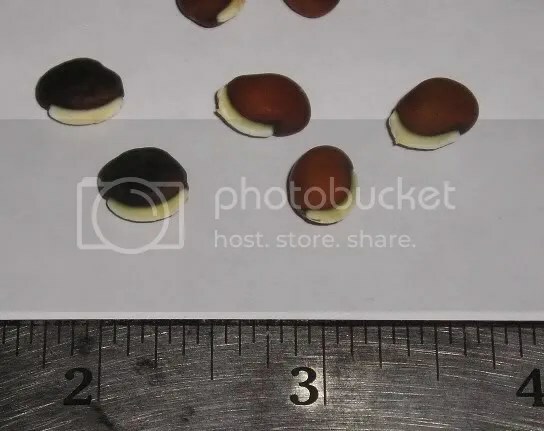 The beans seem to be more popular as an ornamental, here in the U.S., although both the foliage and beans are eaten in parts of Africa, Asia, and the Tropics. The seeds pod can be poisonous if eaten raw and in large quantities, due to the presence of cyanogenic glocosides. I have seen the flavor described as something between a bean and mushroom. The seeds had a peculiar smell after soaking, I couldn’t quite put my finger on it. I planted the seeds yesterday, after soaking. I can’t wait to see these wonderful exotic vines covering the front porch.